REVOC® Tensioned Floating Covers use perimeter tensioning to eliminate sumps which lowers maintenance and cleaning costs. REVOC® Tensioned Covers use cables attached to tensioners to control slack as the cover moves up and down. This eliminates sumps on the cover surface making cleaning and maintenance much easier. The tension from the cables permits people to safely walk on the cover for periodic maintenance. The flat surface of the cover lets precipitation drain more easily and resists damage from ice. The REVOC® Tensioned Cover system is ideal for covering drinking water, preventing contamination, evaporation, and the loss of chlorine disinfectant. REVOC® Tensioned Covers can also be used for waste water where they prevent algae blooms, reduce odor, and prevent dilution with rain water. Layfield can assist you in all aspects of floating cover design including design, construction, cleaning, disinfection, and maintenance services. 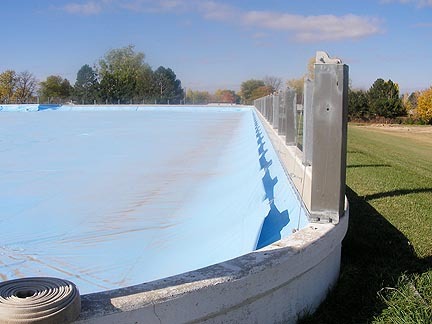 Layfield's REVOC® Tensioned Cover designs, installation techniques, and maintenance protocols fully meet the requirements of AWWA M25 Lining and Floating Cover Guidelines. Defined Sump covers are the standard for potable water floating covers for all sizes of reservoirs.